"What's the name? Is it Mafia?" "No," [Joseph] Valachi said. "It's not Mafia. That's the expression the outside uses." "Is it of Italian origin?" "What do you mean?" Valachi parried. "We know a lot more than you think," [FBI agent James] Flynn said. "Now I'll give the first part. You give the rest. It's Cosa—"
The FBI never revealed in detail how it determined La Cosa Nostra was allegedly the true name of the organization. The Bureau only admitted it "gradually learned" about the term through its "intelligence gathering." But recently declassified FBI documents show for the first time how La Cosa Nostra entered the lexicon of American crime and became the new name for the Mafia. Throughout its history, the Mafia had been known by many names including the "fratellanza" (meaning brotherhood), "onorata società" (honored society) and the "Italian Syndicate." In fact, Mafia crime families often had their own local names like the "Outfit" in Chicago or the "Organization" in Philadelphia. Before Apalachin, the FBI rarely targeted Mafia organizations, preferring to let local police or other law enforcement agencies investigate them. The FBI believed the investigations were generally beyond its purview. This gave rise to the suspicion, in some quarters, that FBI Director J. Edgar Hoover was somehow in the pocket of Italian mobsters. Once the FBI joined the battle, it deployed a massive eavesdropping program against mobsters to learn about their organizational structure, membership and criminal activities. It also began a coordinated program to develop informants in the Italian underworld. It was through these two programs that the FBI learned about La Cosa Nostra. Over the following months, he filled in the gaps in the FBI's understanding of Mafia groups. He was among the first "live" informants to ever share this kind of Intel. Before him, most of what the FBI knew about the structure of a crime family had been gleaned from listening devices. FBI report, March 8, 1962. The informant told federal agents that there were five crime families in New York City. Each boss ruled over a crime family of "button men" with the help of an "underboss," "consuleri [sic]" and "caporegima [sic]." This kind of information would become very familiar to federal agents over the coming years as they built up their knowledge of Mafia groups, but at the time it was new or relatively new for most of them. He said "the overall organization in the Italian underworld is referred to as 'La Causa Nostra' (Our Cause), and that this entire organization is divided into groups referred to as 'families' in key areas of this country." 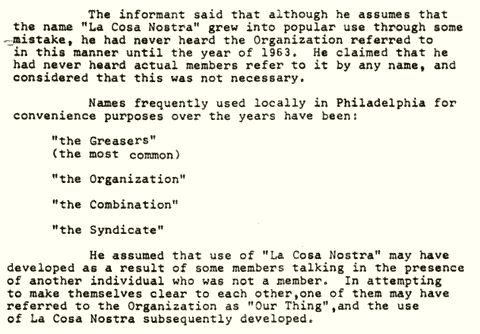 According to the informant, the term "La Causa Nostra" was "interchangeable with the word 'Mafia.'" But that raises another point. Did the informant actually call it "Our Cause" or was that the FBI's own translation? An FBI report from 1963 stated that the informant did indeed call it "Our Cause." However, reports issued closer to September 14, 1961, the date the informant supposedly gave the translation to the FBI, are less assertive on that detail. The older reports don't state explicitly that the informant called it that himself. The Profaci Crime Family associate was likely Louis Ferrini, a convicted burglar. He operated under the informant symbol code "NY 3368." Ferrini became a cooperating witness for the state of New Jersey after he got caught up in a murder in the 1950s. He eventually reached out to the FBI to share details about "La Causa Nostra" and the Italian underworld. Then where did the term "Our Cause" come from? (If the informant didn't call it "Our Cause," what did he call it?) It could be the case that the FBI came up with that translation itself based on it's own misassumption that informant was calling it "La Cause Nostra" in Italian. That seems like a possibility if you consider no other informant ever told the FBI that the organization's name in English was "Our Cause." Of course, if the term "Our Cause" was the FBI's own creation, it raises the likelihood that the informant was actually referring to "La Cosa Nostra" all along, and that "La Causa Nostra" was a wild goose chase from the start. There are no available FBI reports issued contemporaneous with September 14, 1961, so it becomes difficult to separate what the informant stated from what later federal agents thought he said years afterwards. It's important to note the informant himself allegedly referred to "La Cosa Nostra" (or "La Causa Nostra.") At least one other future source would also refer to "La Cosa Nostra." The FBI would later be a accused of arbitrarily adding the definite article "La" to the term but that appears to be untrue. On November 3, 1961, the new Intel developed in New York was distributed to every FBI office in a memorandum written by FBI Director J. Edgar Hoover. Hoover ordered federal agents to treat this "sensitive information" with "extreme caution" and keep it within the Bureau. 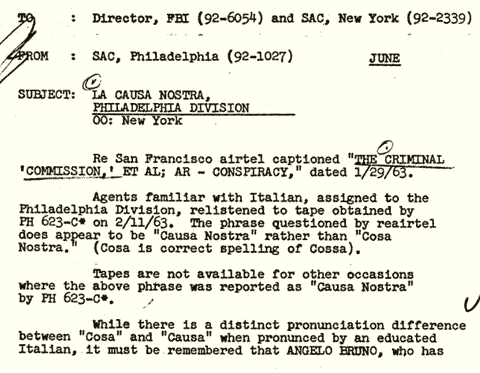 This was likely the first time most FBI agents would have heard of the term "La Causa Nostra," as the Bureau was then calling it. Soon afterward, the new term was picked up by FBI listening devices hidden in mob hangouts in the Philadelphia-area. Philadelphia Crime Family members were recorded referring to "La Causa Nostra" multiple times between 1962 and Joseph Valachi's appearance at the McClellan Hearings in the fall of 1963. There appears to be no recording of a Philadelphia mobster using the term in English. And then later on in the same conversation: "But Mr. Maggio [a prominent mobster] came to my house one time. He had a proposal from Causa Nostra." Initially, the FBI's Philadelphia Office didn't understand what they were hearing. Federal agents in Philadelphia thought "Causa Nostra" referred to "matters of importance to the family" or to being a member of the Mafia Commission. This misunderstanding is hard to understand since Hoover had already explained in an memorandum distributed a few months earlier that "Causa Nostra" was likely another term for the Mafia. The Philadelphia Office eventually figured out the "unknown phraseology" and produced a short glossary to help federal agents understand the new Mafia jargon. But this wouldn't be the last time federal agents in Philadelphia would be a step behind. The FBI caught its biggest break in September 1962, when Genovese Crime Family member Joseph Valachi was persuaded to become a cooperating witness against the mob. He had fallen out of favor with his mob superiors and had decided to turn on them. Valachi's testimony at the McClellan Hearings and his bestselling memoir would help to push the secret society into the open for good. When Valachi turned, the FBI had been aware of the new terms for nearly a year but it still thought the organization was called "La Causa Nostra" and that it meant "Our Cause." So when FBI agent James Flynn first confronted Valachi about the alleged true name of the Mafia - a scene recalled by author Peter Maas in The Valachi Papers - Flynn would have actually accused Valachi of being a member of "Causa Nostra," not "Cosa Nostra." After Valachi's debriefings, FBI documents began to include "Our Thing" as another way to refer to the organization. It would be another year though before the FBI discarded "Our Cause" as an acceptable term. The FBI, however, remained in the dark about the correct spelling and pronunciation of the term in Italian. Federal agents still thought Valachi, like other sources before him, was actually saying "Causa Nostra" and continued to refer to it that way in documents. (The FBI doesn't seem to have accounted for the fact "Our Thing" didn't translate into "Causa Nostra.") This misunderstanding was likely due to Valachi's poor language skills and the lack of an Italian-speaking FBI agent to handle him. The correct spelling of "Cosa Nostra" would continue to elude the FBI until an obscure mobster in California began to talk a few months later. Joseph Valachi may be the most notorious member-informant from the 1960s, but there were others who secretly provided key information to federal agents without fanfare. One of the most helpful was San Jose Crime Family member Salvatore Costanza, who began to cooperate in 1962. He would go on to identify mobsters in three crime families and to provide confidential information about organized crime in California for years. Costanza was also the first mobster to provide federal agents with the proper spelling of the term "Cosa Nostra" in Italian. FBI memorandum, Jan. 23, 1963. 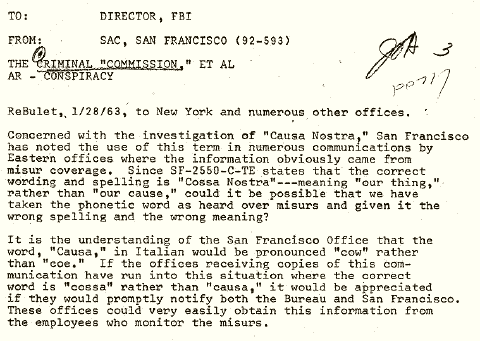 Costanza directly challenged the FBI's notion that earlier sources were saying "Causa Nostra" at all. He was also the second member-informant, after Valachi, to insist that the name of the organization in English was "Our Thing." FBI Airtel, Jan. 29, 1963. The FBI's Philadelphia Office pushed back hardest against the suggestion that there had been a mixup of the terms. Agents there may have felt they had the most invested in the old spelling and meaning since their office had supplied some of the original Intel. Philadelphia re-listened to the most recent recording it had of Bruno using the term and insisted that "the phrase questioned by [the San Francisco Office] does appear to be 'Causa Nostra' rather than 'Cosa Nostra.'" They did concede, however, that Bruno "may actually be saying 'Cosa,' but because of his limited command of the language, he may be slurring its pronunciation." FBI Airtel, Feb. 19, 1963, p. 1. At the same time the FBI was building up its case for La Cosa Nostra and "Our Thing," other secret member-informants were raising doubts about how common the terms really were in the Italian underworld. In May 1963, veteran Los Angeles Crime Family member Salvatore Piscopo began to cooperate with the FBI, months before Joseph Valachi. Piscopo had come to California decades earlier from Naples via New York City. He was familiar with the many different variations of the Mafia traditions in the United States and in Italy. He told federal agents that the organization in Southern California was called the "situation" or the "outfit." Piscopo said it was "the outgrowth of the old Mafiosa [sic]." He made no mention of La Cosa Nostra or "Our Thing" when he first communicated with federal agents. Longtime Philadelphia Crime Family member Harry Riccobene also questioned the usage of the terms. Riccobene was inducted in the 1920s and was the son an original member of the Philadelphia Crime Family. He was well-positioned to give historically grounded feedback. FBI memorandum, May 25, 1964. Riccobene said he "assumed that use of 'La Cosa Nostra' may have developed as a result of some members talking in the presence of another individual who was not a member. In attempting to make themselves clear to each other, one of them may have referred to the Organization as 'Our Thing', and the use of La Cosa Nostra developed." These three informants suggest Italian crime families around the country used a variety of terms to refer to the same organization. The statements of Scarpa, Piscopo and Riccobene would seem to undercut any universal claims made by the FBI about "La Cosa Nostra" or "Our Thing." But the FBI seems to have completely ignored or discounted all of what they said. New England Crime Family mobster Vinnie Teresa told federal agents in November 1962 that the local Italian criminal organization was called "the Mafia, the Family and the Syndicate." Teresa said "he was aware of this information because his grandfather was a Don in Italy in the town of Palermo, and he obtained the information through his family." Teresa never mentioned anything about LCN when given the chance early on. The FBI eventually came down in favor of the San Francisco Office's point of view. In April 1963, the FBI settled on Cosa Nostra and "Our Thing" as the correct terms. It had been nearly eighteen months since the unidentified Colombo Crime Family associate first revealed the Mafia's secret name. Reading between the lines, the FBI appears to have first accepted that the correct term in English was "Our Thing." And then working backwards from English to Italian, the Bureau then determined that the correct translation was "Cosa Nostra." It was an acknowledgement that its original assumption that the correct term in English was "Our Cause" was wrong. The name-change was formally incorporated into the FBI's Semi-Annual Organized Crime Report produced by James Flynn and the New York Office in July 1963. From here on in, the FBI officially used La Cosa Nostra and "Our Thing" to refer to the organization, and dropped the other terms. What remains unclear is why the FBI adopted the use of the term "La Cosa Nostra" over the more grammatically correct "Cosa Nostra." While it's true that both terms were used by mobsters, the two informants to provide the most definitive information about the usage, Joseph Valachi and Salvatore Costanza, referred only to Cosa Nostra. In fact, Costanza directly rejected "La Causa Nostra" as the correct organizational term. The only "live" source (i.e. non-listening device) to refer to La Cosa Nostra (or La Causa Nostra) was the original Colombo Crime Family associate. Next to fully inducted member-informants like Valachi and Costanza, his word should have counted for less. Moreover, Cosa Nostra translated neatly into "Our Thing" which was what Valachi and Costanza (and every other subsequent member-informant) called it in English. A literal translation of La Cosa Nostra was "The Our Thing," which made no sense and would seem to disqualify its general usage by members. No informant ever used the term "The Our Thing." Some have pointed to former FBI Director Hoover's alleged preference for three-letter acronyms as the reason but there is no evidence that that was a factor here. Nonetheless, it could help to explain why the FBI appeared to go against its own best evidence. La Cosa Nostra and "Our Thing" began to be seen increasingly as the proper way to refer the organization. Law enforcement agencies across the country adopted regular use of the terms as did newspapers and magazines. A survey of the New York Times showed the term, "La Cosa Nostra" appeared zero times in 1962 but had over one hundred search results by 1964. Even crime families themselves were impacted. Los Angeles Crime Family member Salvatore Piscopo is a good example of how the FBI's use of the terms changed the language of the organization itself. 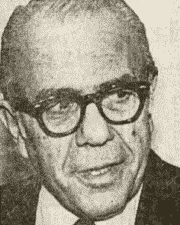 Piscopo began to cooperate about 1962. He told federal agents when he was first interviewed that he was a member of what he called the "situation" or the "outfit." He made no mention of La Cosa Nostra. Yet, two months after Valachi testified on national television, Piscopo was interviewed again and gave a different answer. Now he said the organization was really called La Cosa Nostra. There were no more references to the "situation" or the "outfit" from him. The same pattern occurred in Milwaukee. In five short years, the term "La Cosa Nostra" had gone from being (mostly) unheard of in Milwaukee, to becoming the secret way members there referred to their organization. It's clear the decision by the FBI to formally adopt the term "La Cosa Nostra" did as much to popularize it among some crime families as any boss ever did. It's hard to know how much weight to give these informants because many of them remain unidentified and for the most part appear to be non-members. But two member-informants did tell the FBI that the organization had undergone a deliberate name change in the past. These informants had provided reliable and accurate information in the past. Philadelphia Crime Family member-informant Rocco Scafidi seemed to back up Costanza's statement with even more details. Scafidi began to cooperate in 1964. His father and uncle who were both original members of the Philadelphia Crime Family in the 1920s. 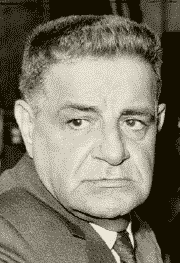 According to Scafidi, he first became a member of the Philadelphia Crime Family in 1950, at a ceremony conducted by boss Joseph Ida. At the time he was being inducted, Ida welcomed him into the crime family using the phrase, "This represents the Mafia and we are all the Mafia." There was no mention of LCN during the induction ceremony. Scafidi formally rejoined the crime family at a second induction ceremony in 1960, alongside a batch of new recruits. He was present when new boss Angelo Bruno, who had succeeded Joseph Ida, administered the oath to the new members. According to Scafidi, Bruno welcomed them with the phrase, "We represent La Cosa Nostra. This family is La Cosa Nostra. ...This Family is called La Cosa Nostra." Bruno made no mention of the term "Mafia" like Ida had ten years earlier. 1 Peter Maas, The Valachi Papers, New York: G.P. Putnam's Sons, 1968, 36. 2 Senator John McClellan of Arkansas led the United States Senate Permanent Investigating Committee in this period. The committee's investigations became popularly known as the McClellan Hearings or the Valachi Hearings. 3 U.S. Congress, Investigation of the Assassination of John F. Kennedy, HSCA Report, Volume IX, F, La Cosa Nostra, 19. The FBI was accused of fabricating the term "in order to avoid embarrassment to Director Hoover, who had failed to issue a public warning about 'The Mafia.'" The President's Commission on Law Enforcement and Administration Justice, Task Force on Organized Crime, Task Force Report: Organized Crime. Annotations and Consultants' Papers Washington: U.S. Government Printing Press, 1967, 27. Former New York City detective Ralph Salerno interviewed numerous informants and listened to hundreds of recorded conversations between mobsters. Salerno testified he only heard mobsters refer to Cosa Nostra twice: once before 1963 and once after. 4 FBI, Changed La Cosa Nostra aka a Cosa Nostra, Cosa Nostra, La Causa Nostra, a Causa Nostra, Causa Nostra, Onorata Societa, New York Office, July 1, 1963, p. 8, NARA Record No. 124-10337-10014. Nicole Gentile was the source. 5 HSCA Report, Volume IX: F. State and Local Efforts p. 11. 6 FBI, Crime Conditions in the New York Divisions, New York Office, Nov. 27, 1963, p. 147A, NARA Record No. 124-10348-10069. 7 FBI, The Criminal Commission, New York Office, Dec. 27, 1962, NARA Record No. 124-10217-10098. The informant was described as "a native of New York City who was born on the Lower East Side and raised in the Bath Beach section of New York. He possesses an extensive criminal record and has been associated with members of the Joseph Profaci group for many years." He began to cooperate at least two months before Colombo Crime Family member-informant Gregory Scarpa. 8 FBI, La Cosa Nostra, Director, Nov. 21, 1967, NARA Record No. 124-10289-10195. The turmoil within the Colombo Crime Family in the 1960s seems to have created an unusual opportunity for the FBI to develop informants. 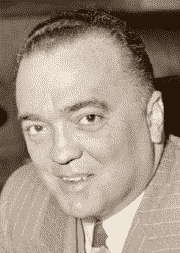 FBI Director J. Edgar Hoover noted that "experience has shown that it is in periods of serious internal strife...that some of our best coverage of La Cosa Nostra has been developed..."
9 FBI, Crime Conditions in the New York Divisions, New York Office, March 8, 1962, NARA Record No. 124-90066-10006. The FBI maintained the informant said it meant "Our Cause," but it's possible the FBI came up with that translation itself based on what it thought was the correct Italian term. ; FBI, La Causa Nostra, Tampa Office, June 4, 1963, NARA Record No. 124-10200-10440. Genovese Crime Family member Anthony Russo was secretly recorded in 1962 referring to the organization as "Our Cause." The conversation was a mixture of English and Italian so it's unclear if Russo actually used those words himself or if that was the FBI's own translation from the Italian. It could be he actually referred to "Cosa Nostra" and the FBI mistranslated. 10 FBI, Criminal Intelligence Digest, Nov. 3, 1961, NARA Record No. 124-10220-10089. 11 This assumes the informant had a rudimentary understanding of the Italian language. 12 FBI, Criminal Intelligence Digest, Nov. 3, 1961, NARA Record No. 124-10220-10089. 13 FBI, The Criminal Commission, Philadelphia Office, Dec. 7, 1962, NARA Record No. 124-10217-10104. The report says the term was first heard in Philadelphia in January 1962, but no example could be found before February 17, 1962. FBI, Angelo Bruno, Philadelphia Office, March 27, 1962, NARA Record No. 124-10219-10066. Listening devices were hidden inside three Bruno-connected businesses: the Penn-Jersey Vending Company, Maggio	Cheese Company and Globe Sanitation. 14 FBI, La Causa Nostra, Philadelphia Office, June 18, 1963, NARA Record No. 124-10200-10455. In May 1963, Angelo Bruno and Colombo Crime Family leader Joseph Magliocco referred to "La Cosa Nostra" in conversation with one another. 15 FBI, Angelo Bruno, Philadelphia Office,	March 27, 1962, NARA Record No. 124-10219-10066. Bruno spoke a mix of English and Italian, and used previously unknown Mafia jargon which sometimes left FBI translators unsure of the meaning of what was being said. 16 Although the FBI began to secretly record Angelo Bruno in 1959, he was only heard referring to LCN after Hoover had issued his memo in November 1961. Perhaps Bruno had used the term before then but agents had overlooked it and it never made it into the transcripts. Recording tapes were typically reused so the FBI was unable to go back and check. 17 FBI, Angelo Bruno, Philadelphia Office, Jan. 2, 1963, NARA Record No. 124-10220-10084. Nicoletti was recorded on December 22, 1962. 18 FBI, Angelo Bruno, Philadelphia Office, July 28, 1962, 480, NARA Record No. 124-10222-10224. 19 FBI, Angelo Bruno, Philadelphia Office, March 27, 1962, 82, NARA Record No.124-10219-10066. 20 Valachi began to share confidential information with the Federal Bureau of Narcotics (FBN) in June, 1962. It appears, though, he didn't begin to refer to "Cosa Nostra" until meeting with FBI agents in September 1962. 21 Joseph Valachi, The Real Thing: The Autobiography of Joseph Valachi (unpublished), 305, mafiahistory.us. Valachi says he was inducted in the presence of bosses Joseph Bonanno, Joseph Profaci, Salvatore Maranzano, and Tom Gagliano. This suggests the term "Cosa Nostra" was familiar to them and used	across all Five Families. 22 FBI, La Causa Nostra, New York Office, Jan. 31, 1963, NARA Record No. 124-10211-10300. 23 David Leon Chandler, Brothers in Blood: The Rise of the Criminal Brotherhoods, New York: E. P. Dutton	& Co. Inc., 1975, 155. According to Chandler, the term "Cosa Nostra" was used as early as 1927. 24 FBI, La Cosa Nostra, C.A. Evans to Mr. Belmont, Aug. 12, 1963, NARA Record No. 124-10220-10102; HSCA Report, Volume IX, G. The Kennedy Program, p. 20. According to the FBI, Valachi's "Italian was very poor, spoken in the coarse which he had learned by ear as he grew up. His pronunciation was very poor." Douglas Valentine, The Strength of the Wolf: the Secret History of America's War on Drugs, London: Verso, 2004, 285. Former FBN agent Frank Selvaggi, who helped to turn Valachi, thought the lack of Italian-speaking FBI agents contributed to the subsequent confusion over the terms. 26 FBI, Criminal "Commission," San Francisco Office, Jan. 23, 1963, NARA Record No. 124-10217-10120. 27 FBI, La Cosa Nostra, San Francisco Office,	Sept. 12, 1967, NARA Record No. 124-10293-10340. 28 FBI, Changed La Causa Nostra, New York Office, Jan. 31, 1963, NARA Record No. 124-10211-10300; FBI, Criminal "Commission", San Francisco Office, Jan. 23, 1963, NARA Record No. 124-10217-10120. Costanza's pronunciation confused FBI agents. The report says "the informant does not seem to	pronounce the letter "R" in Nost(r)a and indicates that the use	of the letter "R" in pronunciation is used more among main-land	Italians than Sicilians." 29 U.S. Congress, Investigation of the Assassination of President John F. Kennedy, HSCA Report, Volume V, Testimony of Ralph Salerno, 439. Listening devices overheard Buffalo boss Stefano Magaddino refer to Cosa Nostra numerous times throughout 1963. FBI Memorandum, ASAC Karl L. Brouse, BU 280-C*, Jan. 30, 1963, NARA Record No. 124-10346-10009. Magaddino was recorded telling an associate in Italian: "This friend of ours - when we are by ourselves, he can do anything he	pleases, because there is no one who more faithful to our thing." U.S. Congress, Investigation of the Assassination of President John F. Kennedy, HSCA Report, Volume IX, J. 1963: Feeling the Pressure. In May 1963, Gambino Crime Family members Michael Scandifia and Peter Ferrara were secretly recorded wondering how it was possible the FBI knew so much about "the Cosa Nostra." 30 FBI, The Criminal "Commission", San Francisco Office, Jan. 29, 1963, NARA Record No. 124-10211-10290. If the search for the correct terms wasn't ungainly enough, the FBI spelled "Cosa" as "Cossa" in this document. 31 FBI, The Criminal Commission, Philadelphia Office, Dec. 7, 1962, NARA Record No. 124-10217-10104; FBI, The Criminal "Commission," Director, Jan. 16, 1963, NARA Record No. 124-10217-10115. For example, it was the Philadelphia office that first suggested the investigation into the Mafia be changed to "La Causa Nostra" from "The Criminal Commission." 32 FBI, La Causa Nostra, Philadelphia Office, Feb. 19, 1963, NARA Record No. 124-10211-10304. The report says that FBI could only review the most recent tape because the older recordings had been reused and were "not available." According to the FBI, Bruno couldn't read or write in Italian. 33 FBI, Top Echelon Criminal Informant Program, New York Office, June 7, 1962; FBI, La Causa Nostra, New York Office, Jan. 31, 1963, NARA Record No.124-10211-10300. Researcher Angela Clemente has brought to light the full extent of Scarpa's cooperation and how much he secretly shaped the FBI's early understanding of the LCN. 34 The FBI never indicated if it found it peculiar that Scarpa, an inducted member, was unaware of the term but a Colombo Crime Family associate was. 35 FBI, La Causa Nostra, Los Angeles Office, June 6, 1963, NARA Record No. 124-10200-10446. Piscopo may have actually talked in May, 1963. 36 FBI, La Causa Nostra, Philadelphia Office, June 11, 1963, NARA Record No. 124-10200-10455. 37 FBI, La Cosa Nostra, Philadelphia Office, May 25, 1964, NARA Record No. 124-10286-10371. Riccobene was imprisoned for much of the 1950s and 1960s for heroin trafficking and admitted he was unaware of "some of the changes of [crime family] membership, control, and policies." Valin, Edmond, "Two inducted members provided the FBI with info on the Philly Mob," mafiahistory.us. 38 FBI, La Causa Nostra, New York Office, Jan. 31, 1963, NARA Record No.124-10211-10300. Riccobene seems to have forgotten that federal agents asked him about the term in December 1962. He "advised that the Mafia, Organization and La Causa Nostra, all different names, are the same group. The methods of operations, practices, and even some of the customs have changed with the passage of time." 39 FBI, La Cosa Nostra, Cleveland Office, June 15, 1964, NARA Record No. 124-10287-10209. Statements from two Cleveland member-informants in 1964 reinforce the notion the terms were probably regional. Federal agents reported that neither Cleveland mobster "admit[s] [to] ever having heard of 'La Cosa Nostra' until Valachi testified in Washington. Many sources state that there is an Italian underworld organization in Ohio, which is referred to by such names as 'outfit', 'organization', 'syndicate', 'group', 'commission', 'Black Handers', 'Mafia', and similar type names." 40 FBI, La Causa Nostra, New York Office, April 23, 1963, NARA Record No. 124-10284-10230. The information connected to the Newark Office appears to be recordings of crime bosses Sam DeCavalcante and Angelo DeCarlo. 41 FBI, Mafia-Central Research Matter, R.W. Smith to W.C. Sullivan, May 17, 1963, NARA Record No. 124-10284-10252. 42 FBI, La Cosa Nostra, C.A. Evans to Mr. Belmont, Aug. 12, 1963, NARA Record No.124-10220-10102. The FBI would go on to blame any misunderstanding about the terms on the original sources who "were not proficient in handling the Italian language....and...[they] were furnishing [only] loose translation[s] of the Italian." 43 FBI, Changed La Cosa Nostra aka a Cosa Nostra, Cosa Nostra, La Causa Nostra, a Causa Nostra, Causa Nostra, Onorata Societa, New York Office, July 1, 1963, NARA Record No. 124-10337-10014. "The use of 'La Causa Nostra,' translated (Our Thing), as the designation of the organized Italian criminal element in reference to their organization, has been heretofar based on the phonetical sound and spelling of the English word cause, as opposed to the correct Italian word meaning 'thing' is cosa, and the organization, formerly considered 'La Causa Nostra,' should correctly be set forth 'La Cosa Nostra.'" 44 Valentine, The Strength of the Wolf: the Secret History of America's War on Drugs, 285. Former FBN agent Frank Selvaggi thought the FBI had concocted the name change "because [the FBN] had been calling it the Mafia for years, and [the FBI] didn't want to appear to be stealing our thunder." Selvaggi maintained that when Valachi told the FBI about "Our Thing," what he was "referring to was an activity that his faction was engaged in at the time: drug dealing was "our thing" at the time." 45 The five primary sources were the unidentified Colombo Crime Family associate, Angelo Bruno, Frank Nicoletti, Joseph Valachi and Salvatore Costanza. The Colombo informant referred to "La Cosa Nostra," as did Nicoletti. Valachi and Costanza referred only to "Cosa Nostra," while Bruno used both terms. 46 FBI, Special National Broadcasting Company (NBC)Television Program concerning testimony of Joseph Valachi before McClellan Committee, Chanel 4, 7:30 P.M. 10-3-63, Mr. A. Jones to Mr. DeLoach, Oct. 4, 1963, NARA Record No. 124-10215-10315. 47 FBI Memorandum, Joseph Valachi Testimony before McClellan Committee, C.A. Evans to Mr. Belmont,, Aug. 7, 1963, NARA Record No. 124-10220-10082. The FBI was determined to receive primary credit for "the La Cosa Nostra story" over its rival, the FBN. 48 FBI, "The Washington Star" feature article dealing with La Cosa Nostra by Miriam Ottenberg, C.D. DeLoach to Mr. Mohr, July 31, 1963, NARA Record No. 124-10220-10072; FBI, Peter Maas Saturday Evening Post, C.D. DeLoach to Mr. Mohr, July 12, 1963, NARA Record No. 124-10278-10269; FBI, "The Saturday Evening Post" feature article dealing with La Causa Nostra, C.A. Evans to Mr. Belmont, July 15, 1963, NARA Record No. 124-10278-10270. 49 Evan Thomas, Robert Kennedy: His Life, New York: Simon&Schuster, 2000, 257. Kennedy had nixed an earlier attempt by Hoover to publish an article in Reader's Digest under his own name. Kennedy wanted to leak details on his own timetable. FBI, Proposed Article Regarding Organized Crime, C.A. Evans to Mr. Belmont, February 28, 1963, NARA Record No. 124-10220-10081. The FBI thought "publication of this article will be another public service by the Director." FBI, "La Causa Nostra" Publicity Concerning, C.D. Loach to Mr. Mohr, Aug. 6, 1963, NARA Record No. 124-10220-10084. A version of the proposed Reader's Digest article was later published in Parade magazine. 50 Milton Lewis, "'Cosa Nostra' Curtain Opens,"	New York Herald Tribune, Oct. 9, 1963. 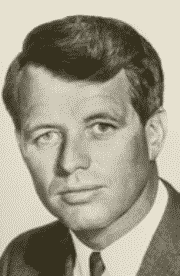 Kennedy's stated hope was that Valachi's appearance would help to achieve two legislative goals: legalize wire taps of criminals and grant immunity to mobsters who cooperate. 51 FBI, Oct. 4, 1963, NARA Record Number 124-10212-10396. Valachi never helped to make many criminal cases as Hoover predicted. 52 FBI, La Cosa Nostra, Los Angeles Office, July 22, 1964, NARA Record No. 124-10208-10406. 53 FBI, La Cosa Nostra, New York Office, Dec. 23, 1963, NARA Record No. 124-10206-10420. Everyone agreed, however, that LCN was just another name for the Mafia. 54 FBI, Criminal Intelligence Digest, Nov. 3, 1961, NARA Record No. 124-10220-10089. The FBI was fearful that	informants would tell them what they wanted to hear. Agents were warned that "particular care is to be taken that this information is not divulged in interviews with live informants or other individuals outside the Bureau in a manner which might result in similar information being "played back" at a later date." 55 FBI, La Cosa Nostra, New York Office, May 28, 1964, NARA Record No. 124-10287-10189. 56 FBI, La Cosa Nostra, Milwaukee Office, Aug. 28, 1968, NARA Record No. 124-10297-10133. 57 FBI, The Criminal "Commission," Boston Office, Dec. 21, 1962, NARA Record No. 124-10217-10097. 58 Valin, Edmond, "Two Gambino informants had very different fates,"	mafiahistory.us. 59 FBI, La Causa Nostra, New York Office, Jan. 31, 1963, NARA Record No. 124-10211-10300. There is no available record indicating if Santantonio provided the English translation of the term. 60 FBI, La Cosa Nostra, Newark Office, April 30, 1964, NARA Record No. 124-10286-10350. Farina was an associate of Angelo De Carlo and Anthony Boiardo. 61 U.S. Congress, Investigation of the Assassination of President John F. Kennedy, HSCA Report, Volume V, Testimony of Ralph Salerno, 449. On August 12, 1963, a listening device picked up San Francisco Crime Family boss James Lanza referring to LCN in a discussion about Joseph Valachi. The conversation makes clear that Lanza was familiar with the term and suggested Valachi's usage was correct. Feather, Bill, Mafia Membership Charts, mafiamembershipcharts.blogspot.co.uk. There were many overlaps between the Colombo and the San Jose Crime Families. For example, Colombo Crime Family members Salvatore Cerrito, brother of boss Joseph Cerrito, and Vincenzo Figlia, both transferred to the San Jose Crime Family. 62 FBI, La Cosa Nostra, Director to Legat, Rome, March 6, 1964, NARA Record No. 124-10286-10316. 63 FBI, Mafia, New York Office, April 9, 1959, NARA Record No. 124-10293-10165; FBI, Activities of the Top Hoodlums in the New York Field Division, New York Office, Sept. 14, 1959, NARA Record No. 124-90103-10093. 64 FBI, La Causa Nostra, New York Office, Jan. 31, 1963, NARA Record No. 124-10211-10300. 65 FBI, La Cosa Nostra, New York Office, Oct. 20, 1967, NARA Record No. 124-10277-10308. Scafidi doesn't spell it out, but the unwanted attention from law enforcement after the Apalachin Meeting in 1957 may have been behind the last name-change. 66 Valin, Edmond, "Two inducted members provided the FBI with info on the Philly Mob," mafiahistory.us. 67 FBI, La Cosa Nostra, New York Office, Aug. 21, 1964, NARA Record No. 124-10205-10471. 68 FBI, La Cosa Nostra, Philadelphia Division, Philadelphia Office, May 14, 1965, NARA Record No. 124-10204-10434. 69 FBI, Angelo Bruno, Philadelphia Office, Aug. 20, 1964, NARA Record No. 124-10225-10302. 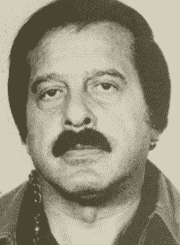 Gambino Crime Family bigwig Giuseppe Traina was a personal friend and lobbied on his behalf. 70 FBI, La Cosa Nostra,	Philadelphia Office, May 14, 1965, NARA Record No. 124-10204-10434. 71 FBI, La Cosa Nostra, Mr. Gale to Mr. Belmont, Jan. 7, 1965, NARA Record No. 124-10223-10339. 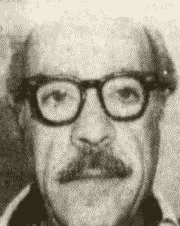 In 1965, a Philadelphia source said Angelo Bruno intended to personally contact Mafia leaders in Sicily and ask for permission to change the name of the organization in the United States again "because of extensive adverse publicity, resulting from our development of detail	regarding La Cosa Nostra." 72 FBI, La Causa Nostra, Newark, Jan. 17, 1963, NARA Record No. 124-10200-10456. Ferrini is identified as source "T-12" in this document. "T-12" is "NY 3368."